Two music powerhouses come together Friday, September 8, for an unprecedented event at the Smithsonian’s National Museum of American History. 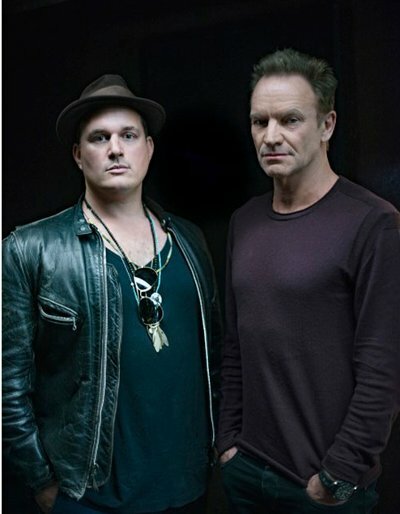 Iconic singer-songwriter Sting, a Rock and Roll Hall of Fame inductee with The Police and 16-time Grammy Award recipient, will join three-time Academy Award-nominated composer, songwriter and social activist J. Ralph for a discussion moderated by journalist, author and news anchor Dan Rather. The discussion will be followed by performances from Sting and the world premiere of J. Ralph’s latest symphonic piece “Evolocean,” featuring the London Symphony Orchestra and recorded at Abbey Road Studios. The event benefits the museum’s culture and the arts programs and a limited number of individual tickets are available for $150 at http://amhistory.si.edu/donate/sting-JRalph-donation. The program will highlight the artists’ musical and philanthropic contributions to American culture. Before the program, the museum will acquire objects from Sting and J. Ralph in a special donation ceremony that is open to press. Sting and J. Ralph recently collaborated on “The Empty Chair,” an evocative song written for the documentary Jim: The James Foley Story, about American photojournalist James “Jim” Foley who was kidnapped in Syria and went missing for two years before his tragic death sent shockwaves around the globe. The song’s Academy Award nomination added to the list of Oscar nods received by each musician. Sting, a founder and lead singer of the group The Police as well as a celebrated solo artist, has garnered many accolades, including 16 Grammy Awards, four Brits and four Oscar nominations; the most recent Oscar nomination was for Jim: The James Foley Story. A Rock and Roll Hall of Fame inductee, Sting has sold close to 100 million albums during the course of his international career. He contributes to many relief foundations and various charities and is the co-founder of the Rainforest Fund with his wife Trudie Styler. He developed a passion for philanthropy very early in his career and has devoted much of his life to the betterment of humanity and the world. J. Ralph is a three-time Academy Award-nominated composer, producer, songwriter and social activist from New York City who focuses on creating awareness and change through music and film. He has written groundbreaking scores for various documentaries, including eight of the Oscar-winning or -nominated documentaries in the past decade. His music has sold more than 10 million records worldwide and topped the Billboard Hot 100 charts in over 22 countries. The event features the world premiere of his transformative Aleatoric piece “Evolocean” performed by the London Symphony Orchestra, the London Voices Choir and his 6-month-old daughter Theodora Ralph. The primary focus of the piece is to raise awareness and funding for species extinction and oceanic preservation.